It’s not often that a race event sponsor can help out directly with proceedings, until now. 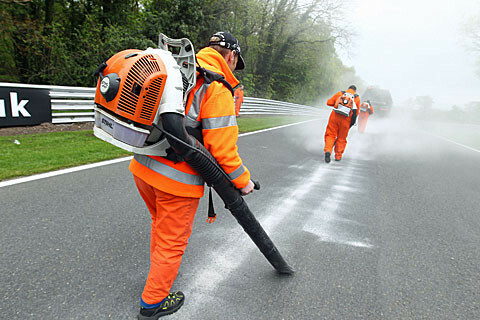 Official MCE Insurance British Superbike Championship sponsors Stihl have provided a fleet of powerful blowers to assist the marshalls and track response teams at each round of this year’s championship. The Track Response Unit is a dedicated and essential team of volunteers and professionals working at every BSB race meeting to marshall incidents, liaise with race control and timekeepers, carry out track maintenance and effectively keep the tight schedule running to time. An important part of their role is keeping tracks clear of general race debris and cleaning up any oil or fuel spillages following a race incident. The Unit’s teams must react instantly and efficiently to ensure the safety of both riders and spectators. Teams are located both in static trackside positions and in a mobile vehicle fleet, ready to respond swiftly should an incident occur. Chief Incident Officer, Karl Booth, has been leading the Track Response Unit for more than ten years and using the STIHL blowers for the last four. He is very impressed with the blowers’ performance, as is his colleague Chris Glendinning who drives the Safety Car at each race meeting and helps co-ordinate incidents on track: “I don’t know how we managed before we had them”, says Chris. The Track Response teams clearly need reliability from any equipment they use, which must also be easy to work with and of course, efficient. Karl Booth explains that the blowers often just sit on stand-by for long periods during an event; they may not be used at all, or they may be used multiple times with just short bursts of activity. That can be a challenging scenario for many two-stroke power tools, but not for the STIHL blowers: “When they are called upon for an incident, we know we can rely on them to fire-up simply and instantly, and we know they’ll perform at the top of their game”, says Karl. British Superbike meetings are run to an exacting minute-by-minute schedule; you can’t wait twenty minutes for the track to be cleared when a race is on satellite broadcasting live on TV. With a minimum two BSB races and multiple support races at each of the season’s twelve rounds, the STIHL tools and the Track Response Unit play a big part behind the scenes, keeping the Series running smoothly and safely. That means riders, teams and their thousands of supporters can enjoy this high-octane sport to the maximum too. STIHL SR450 backpack mistblower: used for spraying liquids or dusting granulates over large areas. BG 86 C-E handheld blower: a true ‘grab and blow’ model, with special ErgoStart easy start mechanism and powerful hurricane equivalent air speed.